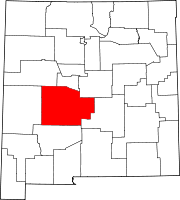 This is a list of the National Register of Historic Places listings in Socorro County, New Mexico. This is intended to be a complete list of the properties and districts on the National Register of Historic Places in Socorro County, New Mexico, United States. Latitude and longitude coordinates are provided for many National Register properties and districts; these locations may be seen together in a map. There are 54 properties and districts listed on the National Register in the county, including 1 National Historic Landmark. Another property was once listed but has been removed. All of the places within the county on the National Register, except for one, are also listed on the State Register of Cultural Properties. (#82003327) 2nd and Oak Sts. (#91000036) 201 School of Mines Rd. (#82003328) 1st and Main Sts. (#74001210) Terry Ave. and California St.
(#82003329) 3rd and Popular Sts. (#82003330) 2nd and Spruce Sts. (#82003332) 200 N. Main St.
(#75001173) Neal Ave. and 6th St.
(#82003333) 2nd and Chestnut Sts. (#82003335) 3rd and Chestnut Sts. 34°03′15″N 106°53′39″W﻿ / ﻿34.054228°N 106.894232°W﻿ / 34.054228; -106.894232﻿ (Rufina Vigil House) Socorro Locally known as "Casa de Flecha"
(#74002268) Park and Church Sts. Wikimedia Commons has media related to National Register of Historic Places in Socorro County, New Mexico. ^ "Magdalena Public Library". Retrieved 2013-10-02. ^ "Magdalena Historic Walking Tour", at Magdalena Chamber of Commerce, retrieved 2013-09-30, archived from original Archived 2013-10-24 at the Wayback Machine 2013-10-24, gives location as "North Main Street". A street-number plaque on the building, visible left of the front door in this 2013 photo, gives the address as "200". ^ "National Register of Historic Places Inventory—Nomination Form: MacDonald Merchandise Building". Retrieved 2016-03-11. ^ The street number is visible in the center of the building in this 2013 photo. ^ Location derived from its GNIS feature record; the NRIS lists it as "Address Restricted"
^ "Walking Tour of Historic Socorro". City of Socorro Tourism. Retrieved 2013-09-13. This page was last edited on 10 November 2018, at 01:11 (UTC).